The last post on exploit kits caused me to look into BeEF. At first glance, BeEF appears to be an open source browser exploit kit. With a little more work, perhaps it could be just that, but it is not quite there. It sure is a neat tool, though, and I’d like to try integrating it into some of my own engagements in the future. Lets look at it. [14:08:02] | Run 'beef -h' for basic help. [14:08:02] |_ Run 'git pull' to update to the latest revision. [14:08:02][*] Successful connection with Metasploit. [14:08:05][*] Loaded 226 Metasploit exploits. [14:08:06][*] 2 network interfaces were detected. The tool has documentation on the wiki here. The documentation is pretty minimal, but for the most part you can figure it out. 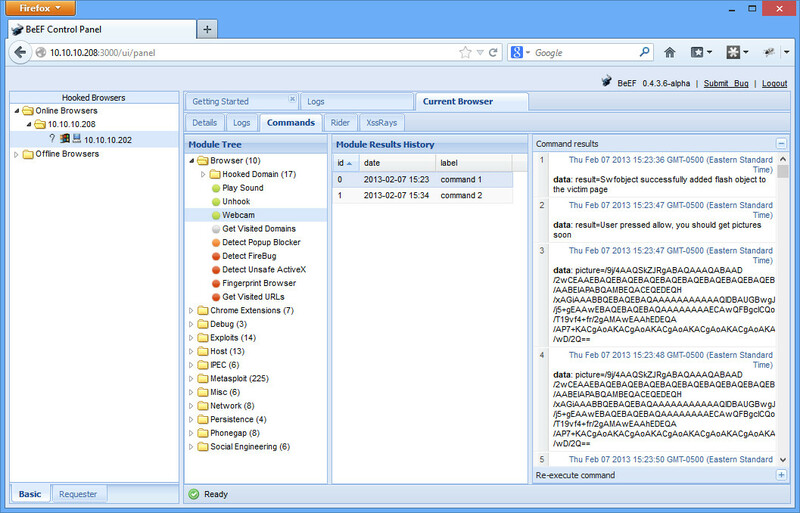 Then you can browse to the admin panel at http://192.168.1.6:3000/ui/panel. The username and password by default is beef/beef (as specified in the config.yaml file). Open up picture.jpg, and you should see your smiling face! Another interesting test you might try is the Metasploit browser_autopwn feature. The wiki gives a good job at describing how to run it here. If you look at the source, all the page does is add in the hook.js file. The setup of BeEF is really slick. There just doesn’t seem to be anything terribly useful yet. It definitely shows the power of Ajax type of programming (in a good way), or how scary XSS can be (in a bad way). Hopefully it can grow into a more mature, useable project. This entry was posted in tools and tagged beef, browser exploitation, exploit kit on February 11, 2013 by admin. I just wanted to put up a blog posting on some research I’ve been doing on exploit kits. I have not seen or used these kits before, so this is all 2nd hand information, but I find the entire concept interesting. Especially that there appears to be such a big market for them. 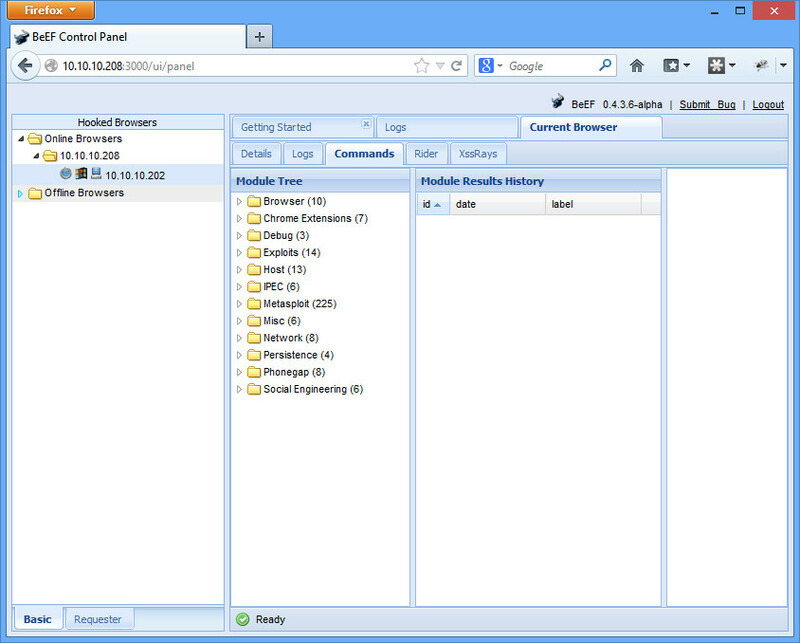 I will use the example of Blackhole, which appears to be the most prolific exploit kit. Others include Nuclear Pack, Phoenix, and Cool. A hacker compromises a legitimate website and injects bad code. This bad code redirects users to a Blackhole page. Another way could be through e-mail; you get SPAM, click on a link, and you end up on a Blackhole page. The Blackhole page determines your plugins (by PluginDetect) to determine your OS and any out of date plugins. Depending on what you appear to be vulnerable to, you’ll be served a bad PDF, Java applet, or Flash file to exploit the vulnerability. Depending on the Blackhole customer’s preference, you’ll receive a payload of Zeus, Fake AV, or another malicious program. These are sophisticated programs for generating revenue for the author. It is not just a ragtag bit of programming. You pay a fee to use the exploit kit. They are rented, not purchased. Blackhole costs $1500 per year, or the more sophisticated Cool (by the same guy as Blackhole) costs $10,000 per month. There is lots of “phone home” action that goes on. Updates come down regularly. You can even get a referral code to be paid as the spammer/hacker that got someone to the Blackhole page in the first place. These kits seem to be mostly foreign. Blackhole is Russian, and I believe much of the documentation is in Russian. This entry was posted in tools and tagged blackhole, crimeware, exploit kit, exploit pack, nuclear pack, phoenix on February 9, 2013 by admin.